Prior to its release, I could be counted amongst the skeptics of The Impossible which portrays the Boxing Day Tsunami of 2004 that ultimately claimed the lives of over 240,000 people. The trailers seemed to show a ‘white washed’ portrayal of the disaster. It’s told from the perspective of a wealthy Western family who are at a beach front resort when the waves first hit. For a disaster that primarily took the lives of hundreds of thousands of South East Asians, this seemed like a disappointingly narrow lens from which to view one of the most devastating natural disasters of the 21st Century. Having seen the film now, I am a convert. The Impossible is an incredible, harrowing film. There is very minimal padding to the introduction before we are thrown into the proverbial deep end. Henry and Maria arrive at a Thai beach resort with their family and less than ten minutes later into the film, the tsunami strikes. The opening half hour of the film in which the tidal waves hammer the shores of Khao Lak are absolutely jaw-dropping. The scenes that show the monstrous waves rolling onto shore and the cataclysmic destruction of everything in its path is utterly convincing. The awe-struck sensation I felt when watching the tsunami was comparable to the Normandy beach landing in Saving Private Ryan or the crucifiction in The Passion of the Christ. I read about the film afterwards and learned that the effects were achived with a combination of miniature sets being flooded with water surges interspersed with shots of the actors in massive water tanks. Minimal computer effects were used. The results are amazing. The tsunami feels tangible, realistic and genuine. Once the tides subside, the family members are seperated, unaware of who has survived, if any. Maria and her son Lukas are the first to find one another and their journey together to find family and medical assistance is the most touching in the film. Naomi Watts and Tom Holland are both exceptional in their performances. They are shattered and exhausted but find strength in one another. Both are stubborn and unrelenting in their will to drive one another to safety. One of them carries a leg wound which made me cringe and cover my face with my hands. There are brief moments of bodily mutilation that are exceptionally difficult to watch if you’re squeamish. Through the perspective of Maria and Lukas, we see a lot of the devastating after-effects of the tsunami which are both sad and disturbing. Trucks and utes pile bodies unceremoniously onto the back. In the heat, it is critical to clear the dead before they begin to rot, spreading disease. The walking dead wander the streets in a state of shock, some barely clothed, most saturated in blood. The hospital scenes are also challenging to watch. The local doctors and nurses are hopelessly inundated with people needing attention and they do the best they can. The film is largely sympathetic in its portrayal of the hospital staff. They work around the clock performing surgeries and doing their best to unite families who are separated. But with so many tourists, there are dozens of different languages being spoken and communication is a big challenge. Shooting films about real life disasters can often be a thankless endeavour. Consider the relatively weak cinematic offerings based on 9/11, such as Oliver Stone’s 9/11 and Stephen Daldry’s Extremely Loud and Incredibly Close, two films I believe were made with good intentions but I found to be rather schmaltzy. I think director Juan Antonion Bayona has done his subject matter justice here. 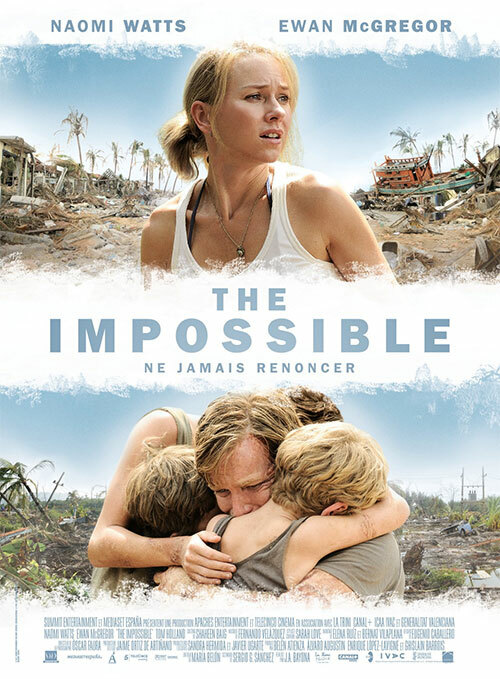 The Impossible doesn’t pull any punches in showing the devastation and the magnitude of the 2004 tsunami but after the disaster strikes, there is a solid family drama that holds the rest of the film together. The performances from the actors are excellent and it unfolds in a context that allows us to learn more about the days after the disaster. We see how people worked to reunite families and how the local community came together to help Thais and tourists alike. 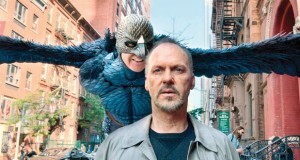 The film is somber in tone and is never too precious or saccharine in its final moment of catharsis. I’ll admit that in 2004 when the disaster first struck, the concept of a lethal tsunami was foreign to me and the death toll was so high that it practically defied my comprehension. Even though it is a comparatively recent event, the tsunami occurred at a time when smart phones with digital cameras were not all that prevalent so little footage exists of what the disaster was like first hand. This film gave me an eye-watering insight into what it would have been like to stand on the beach, hear the rumble of the tide and turn to see oblivion staring you in the face. For what it sets out to accomplish, The Impossible is a phenomenal accomplishment. Summary : A confronting and at times brutal portrayal of the devasting Boxing Day tsunami of 2004 which claimed the lives of thousands.